Let’s welcome the grand fasting time of the year! Navratras have already begun and is celebrated hugely in various parts of the country. The festival is celebrated for nine days with majestic grandeur. It’s a perfect time to detox since fasting helps in avoiding the entry of certain unwanted substances into your body. It is also beneficial for people looking out to shed their calories. So have you also planned to fast this Navratras and looking for the best quality food available in the town? Merataskk provides an option where we help our customers shop for their desired food item and get it delivered right at their door step! All you need to do is enter the pickup and drop location details, and rest is taken care by our taskers. We have listed a few items that you can consume during these nine days. Potato chips: Potatoes are a great source of complex carbs, which can keep you satisfied for a long time and can be a great snack option as well as a meal. For working people, it’s the easiest munching option! Cottage Cheese: While you are fasting, there is usually an alteration in the intake of protein due to certain restrictions in foods. Cottage Cheese can be a great option to level up your protein intake. Relish it with some Sendha Namak and coriander and enjoy the nutritional treat! Sabudana: One of the famous food item during Navratri, Sabudana is liked by one and all! It is a healthy, underrated food which can be cooked in many different ways. Sabudana can be consumed as Sabudana khichdi, Sabudana kheer, Sabudana chaat, etc.A rich source of calcium, vitamins and fiber, Sabudana can be ideal for fasting to keep you active and energised! Kuttu: Kuttu, which is also known as buckwheat, comes into the limelight only during the days of fasting. Since it is not possible to consume chapattis made out of wheat flour, it can be replaced with Kuttu ka atta. Kuttu atta rotis can be the best replacement to wheat chapattis during Navratri. You can have it fried or just smear them in a pan. Also add ghee on top of it to avail more benefits of the fibre, antioxidants and protein content in it. Singhada: If kuttu does not suit your taste buds, you can readily opt for Singhada which is also known as water chestnut. It is a rich source of vitamins and minerals and it is also used as a thickener in various foods. It has a great taste and leaves you with no further cravings. Makhanas: During fasts, it is natural to crave for snacks and junk because of the low intake of other foods. Hence, makhanas can come to your rescue. These are a low-calorie snack which can be consumed as a ready-to-go snack in office while working or at home. They are a rich source of calcium. You can consume it raw or just roast them with Sendha Namak and store it in a container. If you are looking for one of the best munching options for Navratras, Makhanas surely top the list! Suhang ke Chawal – Popular during the fasting season, Suhang ke Chawal are the ideal choice for people looking for light evening food. Make a tasty vegetable pulao with carrot and boiled potato. Eat it with cucumber tomato raita or even plain curd and relish it completely. 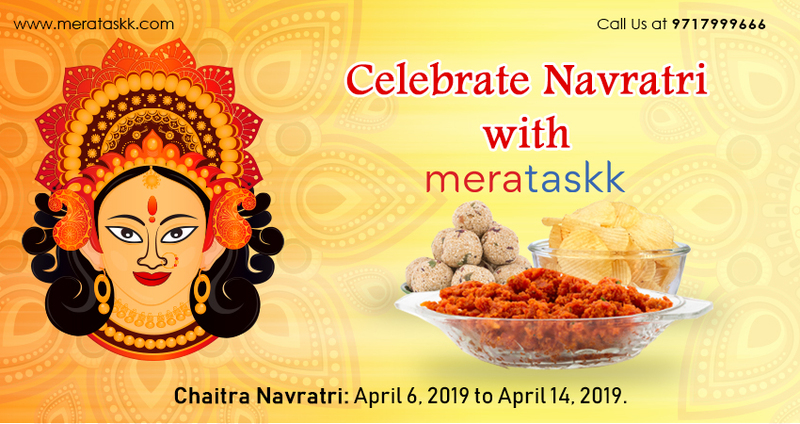 Now that you have so many options to choose from, get the food items delivered on the very same day with special Merataskk Navratras Food Delivery Service! Wishing you all a very happy and prosperous Navratras. « Gear up for the start of the new academic year 2019!